An emergency grilled cheese is just a text away. New York’s Times Square is stressful enough on a regular day. Try visiting during the holidays, with children in tow, and it’s safe to say that patience levels could drop, especially when the little ones are hungry. Kraft hopes to keep temper tantrums at bay—for at least one day—with free grilled cheese delivery. 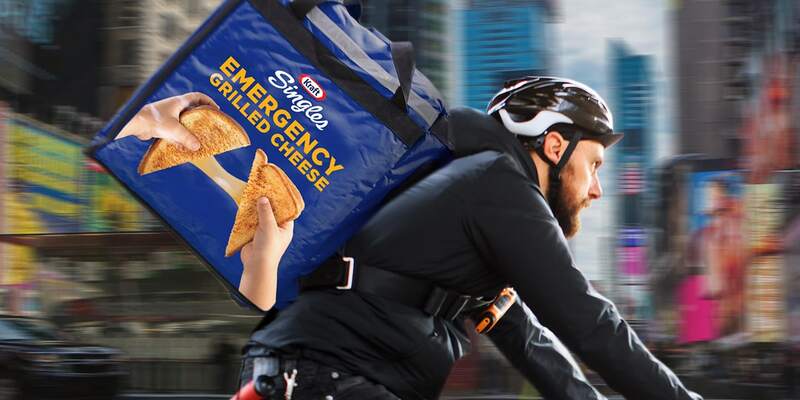 Today, families in Times Square between noon and 6 p.m. can text their name, location and CHZ to 797979 and Kraft will deliver a free grilled cheese sandwich via bike messenger or walking courier. Prevent a meltdown with melted cheese? Is there a separate number for cheese-loving adults who get hangry between lunch and dinner? Actually, those 18 years and up won’t be turned away if they’re jonesing for a grilled cheese to take the edge off. Up to four sandwiches, made at a nearby Five Guys, can be delivered per mobile number, and everyone must be in Times Square (on Broadway or 7th Avenue, between 42nd and 47th streets) for eligibility. Created by Leo Burnett, the campaign hopes to bring a comforting taste of home to overwhelmed kids in a potentially unfamiliar setting. It’s a fun promotion, but some Capri Sun, Jell-O or Kool-Aid (also Kraft Heinz products) could have taken this to the next level. But we can hope that’s in the plan for next year, right? In the meantime, parents, you can now brave the crowds, off-brand cartoon characters and the Naked Cowboy with confidence, knowing that a grilled cheese sandwich is only a text away.